Brighton & Hove Albion manager Chris Hughton feels Jose Izquierdo has been the missing link attacking-wise in recent weeks. The pacy Colombian has missed the last 13 games with a knee injury and has made only nine appearances this season. He impressed in his first campaign in England last year when he netted five goals and provided three assists. Hughton said: "Izquierdo is the missing link as regards having all the different types of offensive options. "He gives us that pace option up front and predominantly on the left-hand side and also the goals he gave us last season. "That's one dynamic that we have missed. "But it's impossible to have everything. As regards what we've had injury wise, we've been very good this season and probably haven't had the wholesale injuries you can have at some stage and that maybe some other clubs have had. "Competition wise we're in good shape and having (Alireza) Jahanbakhsh back as well is a big plus for us." 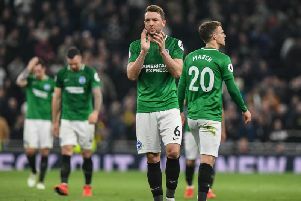 Hughton has also praised the competition for places in the Brighton squad after making ten changes for the midweek FA Cup replay at West Brom. He said: "At this moment we feel we've got a very competitive squad. "What we have been able to do is change the team and what it has seen is a lot of players who haven't had as regular minutes as they would like get them minutes under their belt."